Flawless Self-Tan Liquid 6 oz. We are very easy to work with and will find a solution! We are happy to help. Trending at $25.13eBay determines this price through a machine learned model of the product's sale prices within the last 90 days. Fake Bake's naturally-derived tanning agents will not turn skin orange, leave a bad odor, or stain your clothes. Formulated with Fake Bake's exclusive triple tan formula (DHA boosted by DMI & Erythulose) for an intense tan that lasts longer. 100% Authentic, The box was damaged and discarded ! 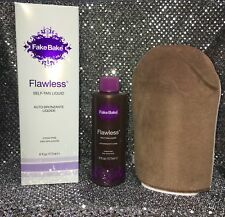 4 out of 5 stars - Fake Bake Flawless Coconut Tanning Serum for Face and Body 5 oz - NEW NO BOX ! 3 product ratings3 product ratings - Fake Bake Flawless Coconut Tanning Serum for Face and Body 5 oz - NEW NO BOX ! Flawless DARKER Self-Tan Liquid 6 oz. Full Size - 6 oz. We are very easy to work with and will find a solution! We are happy to help. This tanning lotion is intended for Sunless use in order to provide long lasting results and a natural, attractive appearance. Trending at $18.43eBay determines this price through a machine learned model of the product's sale prices within the last 90 days. Fake Bake 60 Minute Tan is the go-to choice for those with busy lifestyles or for a quick fix before an occasion. Fake Bake is Paraben and DMDM Hydantoin free so you can feel secure knowing you are using a safe and healthy product. (Apply your tan with the Free tanning mitt included. Instructions, (2) application gloves and applicator mitt included. missing box, item count.). Weight - 8.7oz. Height - 8 1.4in. Width - 2in. Trending at $16.14eBay determines this price through a machine learned model of the product's sale prices within the last 90 days. FAKE BAKE RADIANT GOLDEN GLOW FAIR GRADUAL SELF-TAN FOR FAIR SKIN; 6.0 fl. oz. FAKE BAKE RADIANT GOLDEN GLOW;FAIR;. Fake Bake Original Lotion, 6 oz. Fake Bake Self-Tanning Lotion, 6oz. Get a perfect tan with Fake Bakes richness in color. Easy goof-proof application. New Arrivals. Ultimate in self-tanning lotions Item expires in 10 months after the seal under the cap is broken. 4.5 out of 5 stars - Fake Bake Original Lotion, 6 oz. 36 product ratings36 product ratings - Fake Bake Original Lotion, 6 oz. Flawless is applied with a professional mitt (included) in effortless gliding strokes for a perfectly even tan. Formulated with Fake Bake's exclusive triple tan formula (DHA boosted by DMI & Erythulose) for an intense tan that lasts longer. Maximum strength concentration of our Triple-Tanning Actives. Perfect for confident self-tanners who crave the double shot extras in life. Fake Bake Amplify Daily Lotion Gradual Tan is a powerful and versatile skin lotion that works on three fronts at once. This gradual tanning lotion uses tanning actives to intensify and prolong your tan's colour and glow. BY FAKE BAKE. SELF-TAN LOTION. NEW FORMULA. Flawless Coconut Tanning Serum by Fake Bake for Face & Body 5 fl oz./148 ml. NOTE: The back of the box says as it should be good as long as you use it WITHIN ten months of OPENING the bottle of tanning serum. You can find more details below. Silk Amino Acids: anti-ageing ingredients help to prevent dehydration and wrinkles, leaving skin with a silky soft texture. 4 out of 5 stars - Flawless Coconut Tanning Serum by Fake Bake for Face & Body 5 fl oz./148 ml. 3 product ratings3 product ratings - Flawless Coconut Tanning Serum by Fake Bake for Face & Body 5 fl oz./148 ml. Fake Bake Fair Self-Tan Lotion has been specially formulated for people with fair complexions or anyone who wants a subtle glow. Includes application gloves and step-by-step application advice. Ending Soon. 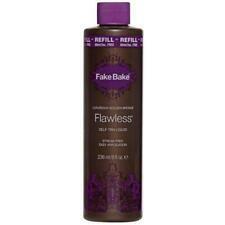 Fake Bake Flawless Self-Tan Liquid is a fast drying, non-sticky formula. Fake Bake Flawless Self-Tan Liquid combines easy application with professional color. Flawless is applied with a professional mitt which is included in effortless gliding strokes for a perfectly even tan. Perfect for confident self-tanners who crave the double shot extras in life. They avoid using harsh chemicals to preserve so it needs to be used 10 months after opening. Can be refrigerated for longer life after opening. For external use only. Patch test required if first use of a self-tanner. Apply on inside of arm - wait 24 hours - if irritation occurs, discontinue use. Not for use on children. Keep out of reach of children. Combined with Ginger Root and Aloe Vera Gel to soothe sensitive skin or irritated skin. Sealed Lotion. Directions and Gloves Included. Self Tan Lotion. Streak Free. Easy Application. For external use only. Patch test required if first use of a self-tanner. Apply on inside of arm-wait 24 hours-if irritation occurs, discontinue use. Not for use on children. Keep out of reach of children. Fake Bake Sport Sport Daily Tan Lotion. New never opened product, tubes have a clear plastic seal with a perforated strip that must be removed before the product can be opened. 6 Fake Bake Tanning Lotions. Fake Bake 5 Minute Mousse is the perfect "ready to wear" tan. You can achieve an instant luxurious deep bronze color with this fuss free, fool proof tanning mousse. Thanks to Fake Bake's cutting edge "color lock-down technology", this lightweight, super-fast drying self-tanning mousse with non-transfer formula will allow you to achieve beautifully bronzed skin with zero drying time. You can dress and be out the door in minutes. A natural golden glow continues to develop with long lasting results. Flawless Darker Self-Tan Liquid & Professional Mitt 170ml. Fake Bake Amplify transforms the overall look of skin whilst gradually adding a natural looking colour. The perfecting formula blurs the appearance of imperfections, whilst tan intensifiers extend the life of your own natural tan. The mitt has a light and flexible texture. This side of the mitt is perfect to use with any of our exfoliating products to gently remove dead skin cells and leave your skin feeling fresh and renewed. Includes step by step application advice and application mitt for easy, streak-free application. Fake Bake Self-Tanning Liquid 60 Minute Tan 8oz. Fast-drying & non-sticky formula. Flawless is applied with a professional mitt (INCLUDED) in effortless gliding strokes for a perfectly even tan. Formulated with Fake Bake's exclusive triple tan formula (DHA boosted by DMI & Erythulose) for an intense tan that lasts longer. This is a new sealed 6 oz bottle of sunless tanner by Fake Bake. Comes with a spray nozzle as well as an application mitt for even coverage and a pair of gloves! Our mousse is the perfect "ready to wear" tan. You can achieve an instant luxurious deep bronze color with this fuss free, fool proof tanning mousse. You can dress and be out the door in minutes. A natural golden glow continues to develop with long lasting results. Fake Bake 5 Minute Mousse is the perfect "ready to wear" tan. You can achieve an instant luxurious deep bronze color with this fuss free, fool proof tanning mousse. You can dress and be out the door in minutes. Contains color guide to prevent streaks and missed spots. Color deepens with every application. Fake Bake Darker Self Tanning Liquid 32.5 fl oz. "Fake Bake 60 Minute Tan Spray, 8 Ounce"